Read about how the team overcame challenges and are celebrating achievements in this blog by Felicity Stocker, Satwinder Kaur, James Patrick, Kamila Naseova, Kay Sookun and Evri Anagnostara. Left to right: Satwinder Kaur, James Patrick, Kamila Naseova and Felicity Stocker. The Bridging the Bedford Gap project aims to raise awareness of the Bedfordshire (and Luton) Recovery College (RC), and improving access to it. It aims to encourage diversity, promoting People Participation and learning about Quality Improvement. The team is also committed to being together and having fun, and to look after each other. 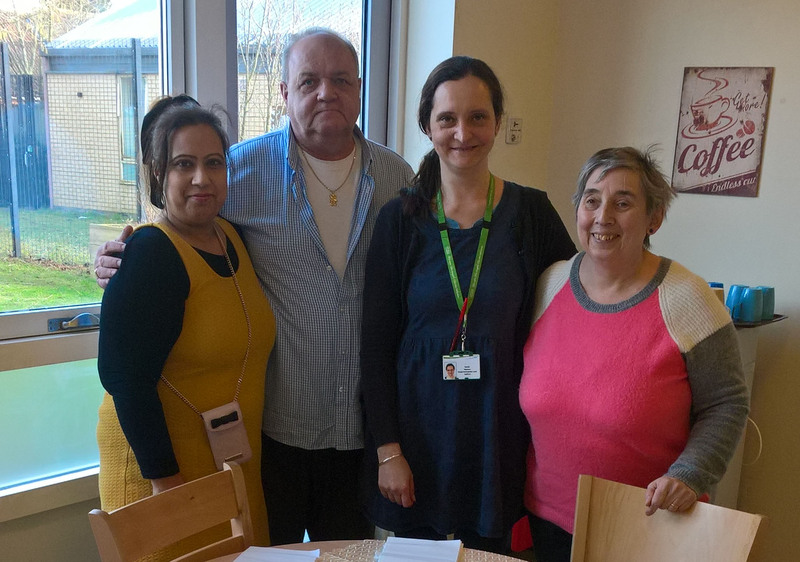 The team consists of a Recovery College manager, Ward managers, people participation lead and three service users: Felicity Stocker (Project Lead), Satwinder Kaur (Tea Party Poetry workshop facilitator) and James Patrick. The whole project is very much service user led. The project started by inviting a number of service users and carers to an initial meeting in the summer of 2017, where we introduced the QI concept and asked all those that attended what we should focus on. We did a brainstorming session in which everyone put one idea on a post-it note and we then scored this according to our priorities. The project that got the highest rating was the Recovery College. We all felt strongly that patients who are on the wards, which are located in Luton, can feel they are far away. The project then would work on ways to link them back to the Bedford community and the fantastic RC. We decided to start on Oakley Court, which is formed of two wards: Ash and Willow. They both offer care for male patients from Bedford Borough and Central Bedfordshire, and are based in Luton. We had a fantastic response from the staff who gave great encouragement to the patients who wanted to take part in the initial project. Before delivering workshops we gathered initial data for four weeks to gauge the knowledge of Recovery College by patients and staff. Then we started the first PDSA (Plan, Do, Study, Act) cycle: a Tea Party Poetry Workshop led by Satwinder Kaur. We plan to offer other sessions on People Participation, Recovery College Brochure walkthrough or work on discharge packs. Since the beginning of the project we have faced several challenges, such as getting initial approval for the project and communication between team members. Travel to Oakley Court from Bedford takes time both by car and public transport. Also, patients are admitted and discharged, so the continuity is not as good as we would like. On the other hand, we have certainly seen some achievements. We have had excellent feedback from ward patients following the Tea Party Poetry sessions, and also buy-in from ward staff. Satwinder Kaur, the facilitator said: “It has been a long journey from losing my identity to mental illness to finding my voice through my passion of Tea Party Poetry. Service users look forward to future sessions”. In the light of all this, we can now say that being familiarised with the ELFT QI methodology has enabled us to learn about how to communicate within the team and with the outside world, to meet new people and to overcome anxiety. We have also been supported by our QI coach, Anna Smith. She is creative and encourages us to test our ideas. We are certainly feeling much more confident now. We are now keen to see how our PDSA cycles are influencing the initial data and want to see how we can share our findings across the Trust. East London NHS Foundation Trust (ELFT) has been using the Life QI platform since June 2015 to manage our Quality Improvement (QI) portfolio. Projects are proposed, approved and worked on through the platform. Learn more about how important this platform is in this blog by our Data Manager Forid Alom.